This is not my standard crime novel or literary fiction – this is a kind of young adult love story which I usually stay really, really far away from – but there is a twist here – both parties have inoperable cancer. But a friend recommended it and I went ahead. The book has an excellent story line and its well told, the 16-year old first person narrator, Hazel, is wonderfully bright and charming – insightful – real (maybe a bit more precocious than most 16-year olds). Hazel’s mother makes her go to a cancer support group for teens. She hates it but goes because she does love her parents dearly – very close family. 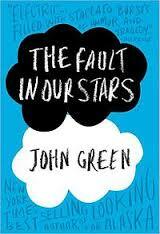 There she meets Augustus, “Gus,” who is “hot.” But they are both dying and they know it. Can you imagine anything more tragic than a 16-year old dying of cancer? Hazel knows what she’s going to miss, what she wants to do before she dies. She knows her life will not make any kind of impact on the world. She gets very tired and sick. But she keeps going. And Gus is the same way – only 17 years old, an athlete. What would be more natural than they meet and fall in love – but what is more horrific than to have to travel the last stages of that life together. And last but not least, Kate Rudd does a truly excellent job with the narration. Wow.